Casa Cora has a size of about 90 sqm, plus terraces.The holiday villa offers unblocked view to the South coast of Lanzarote. Enjoy this wonderful view from the house as well as from the bedrooms, kitchen and salon of this house - and even from the shower of one of the bathrooms. There are 2 bedrooms with 2 bathrooms en suite, a big salon including kitchen and dining area for 4 persons offering sea view. The construction of Casa Cora uses only high quality materials. In order to achieve the exceptionally individual and unconventional style, almost everything was worked by hand and a great deal of care was taken in the selection of furniture and other equipment. The pool can be reached through the natural stone tunnel - it has been integrated into the idyllic garden landscape and has its own sun terrace. 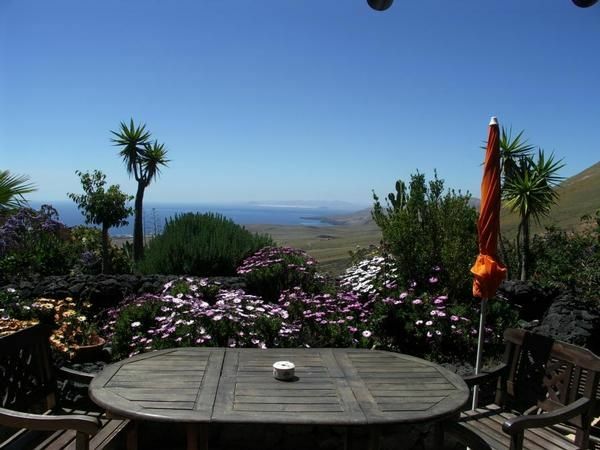 Also from here you have a magnificent, unobstructed view of the Atlantic Ocean to Fuerteventura.